Our optical mirrors are manufactured from either BOROFLOAT® 33 or SUPREMAX® 33 which provide low thermal expansion, high thermal resistance and impressive chemical durability. Advanced Optics square optical mirrors are polished to λ/4 to meet a variety of demanding applications. 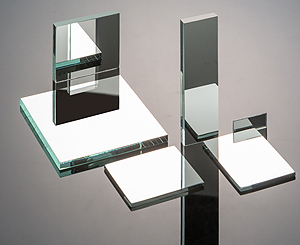 Our precision square mirrors are aluminum coated with a protective SiO overcoat and are available uncoated as well. In addition to our in-stock optical mirrors, Advanced Optics provides custom fabrication and free engineering services. We have the capability to provide custom shapes, apply bevels and even drill holes to meet your unique application. Need a custom coating? No problem.